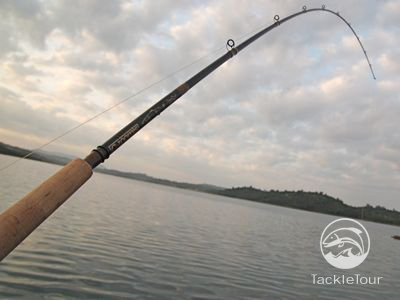 Swimbait Rod Wars Installment #15: G.Loomis, Has the Baseline Been Surpassed? Introduction: Finally we reach the last representative in our Swimbait Rod Wars and the company most responsible for our decision to focus on these rods this year. When we were introduced to G.Loomis's line of big bait rods during ICAST 2007, we knew this specialized area of bass fishing, once thought of as a Southern California only technique, had reached critical mass and it was time to jumpstart TackleTour's review base on arguably the most critical aspect of this technique - the rods. So how does our representative from G.Loomis stack up? Let's find out. Introducing our review on the G.Loomis SWBR955C. Length from Back of Reel Seat to Base 13.5"
Impressions: It's no secret why we choose the G.Loomis product as our baseline for comparison in the majority of our rod reviews. 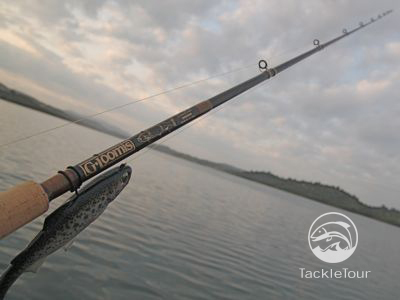 G.Loomis rods are pervasive and their reputation for good performance is consistent, so when describing a rod not easily found in local tackle shops, it's easy to suggest picking up a specific model in the G.Loomis line and comparing how the rod in question will feel compared to that G.Loomis baseline. Lab Tests: So, when reviewing a G.Loomis product, what do we use for a baseline of comparison? The first step is strapping it up to our RoD WRACK and seeing where it falls with similar product in our database. In this case, the other sixteen rods in our Rod Wars! Rate of Deflection (RoD): The SWBR955C falls right into the group of rods we've identified as our "All Purpose" swimbait sticks. 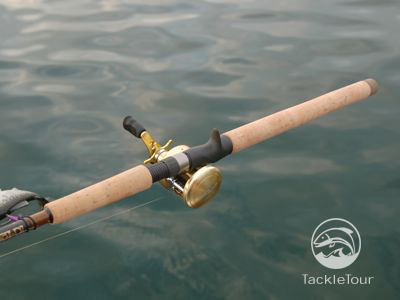 These sticks all have a RoD value between 1 and 1.3 and almost universally have a lure weight recommendation in the range of one to four ounces give or take half an ounce in either direction. Specifically, our SWBR955C compares most favorably to the Kistler KBSBS80 - a rod that won Editor's Choice early on in the Rod Wars. Fig. 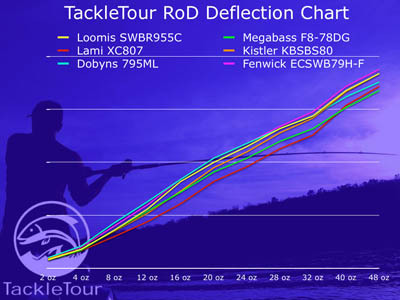 1 : This RoD Deflection Chart shows the deflection characteristics of the G.Loomis SWBR955C (yellow curve) against several similar sticks. Spine, Weight, and Balance Point: The SWBR955C is pretty much what we expected in terms of feel from a G.Loomis product meaning it is not the lightest or best balanced stick in our group of representatives, but rather, it strikes a nice balance between these two criteria. The fact that it is properly spined is just a bonus. During our deflection measurements in our RoD WRACK, the line did come in contact with the blank with about 28 ounces of load - that's 1.5 pounds - not bad really. Rated as a mod-fast taper, you can see that in this photo of the rod under load.